ABU DHABI, (UrduPoint / Pakistan Point News / WAM - 16th Apr, 2019) H.H. Sheikh Nahyan bin Zayed Al Nahyan, Chairman of the Abu Dhabi Sports Council, stated that receiving the title of "Sport Figure of the Year 2018" represents a journey of giving, perseverance and dedication for the nation and its wise leadership, which believes in caring for the youth, as they are the key to advancement and are half of the present and all of the future. He added that caring for the youth, investing in their energies, and enabling them to achieve their aspirations will drive creativity, exceptionalism and excellence among nations while explaining that serving the nation is an honour and duty that everyone can be proud of. "We are proud of this valuable award, which is the result of the generous support, care and vision of President His Highness Sheikh Khalifa bin Zayed Al Nahyan, and the His Highness Sheikh Mohammed bin Rashid Al Maktoum, Vice President, Prime Minister and Ruler of Dubai, and His Highness Sheikh Mohamed bin Zayed Al Nahyan, Crown Prince of Abu Dhabi and Deputy Supreme Commander of the UAE Armed Forces, for the sports sector," Sheikh Nahyan said. "The nation, led by the wise leadership, which is loyal to its pledge and inspires its people, will realise its development goals in all sectors and achieve key national accomplishments that will preserve its well-known successes and strengthen its global pioneering stature," he added. Sheikh Nahyan thanked H.H. 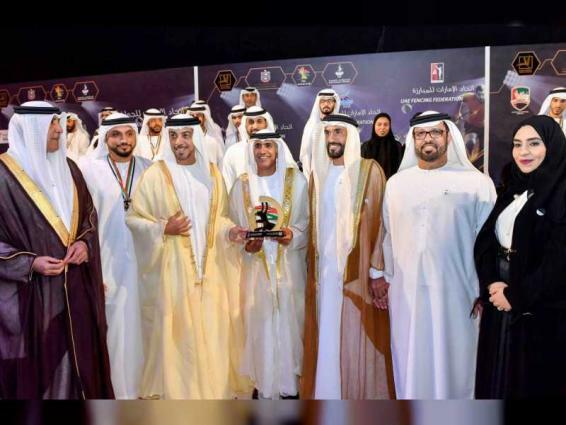 Sheikh Mansour bin Zayed Al Nahyan, Deputy Prime Minister and Minister of Presidential Affairs, for supporting for the sports sector and patronising the annual ceremony to honour those who achieved sporting accomplishments. "In light of the support and care of the wise leadership for the sporting movement, the UAE has become a leading international sporting destination, through hosting major international sporting events, attracting considerable audiences and influencing the agendas of international sporting federations. The UAE has also become the meeting point of champions, leading international athletes, and international sporting decision-makers, and has supported plans to raise the awareness of the community about the key role of sports, through organising activities, competitions, programmes, seminars and conferences, as well as by reaching out to the entire Emirati community to promote sports as a healthy daily lifestyle," Sheikh Nahyan further added. He also stressed that the success of related plans is due to the wise leadership, which sees sports as the key to rapprochement and communication and the message of peace and tolerance among the world’s peoples. Sheikh Nahyan congratulated everyone honoured for their sporting accomplishments, which represent the efforts of the wise leadership to create excellent Emirati sporting institutions and athletes.